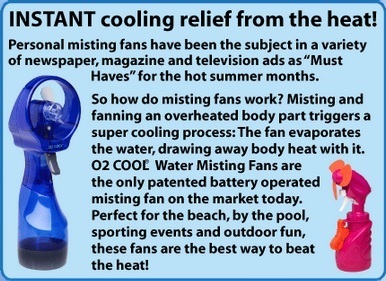 The O2 Cool Deluxe Water Misting Fan has an ergonomically designed round face that provides maximum targeted cooling.This great personal water mister keeps you comfortable in hot weather at the beach, pool, or at sporting events. Product Dimensions (retail packaging): 3.1" x 3.8" x 10.6"heat. 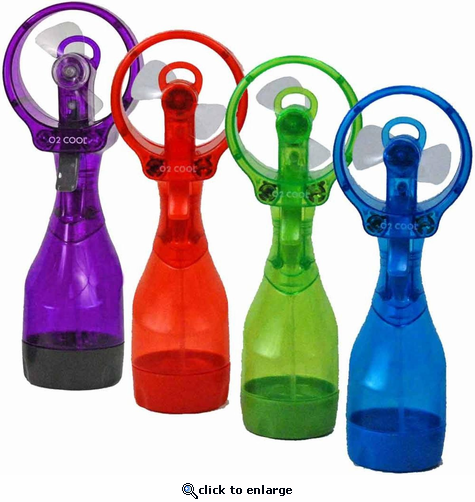 O2 Cool Deluxe Water Misting Fan Instructions: Remove plastic hook before use. For best performance, use fresh alkaline batteries. To install batteries, lift latch on battery compartment door, insert batteries following (+/-) marks and press door closed. To fill, turn fan upside down, unscrew bottom cap, fill bottle with clean water and ice only and replace cap. Do not freeze water in bottle. To operate fan, press the ON/OFF button located on back of fan once. If fan does not operate, verify batteries are installed properly. To spray mist, press the trigger. This was a gift for my daughter and son-in-law. They appreciated it so I am assuming it works well. Ordered 4 and all worked well except that one died after 2 days at Disneyworld and changing the battery was not a solution. The 4 of us managed with the remaining 3 fans with admiration from others in the blistering heat. I purchased 2 of the handheld personal misting fans, and am very satisfied with the product. The site was easy to browse, and it was easy to place my order. The timeframe between placing my order and receiving it was exactly what the said it would be. I would definitely recommend this online store and product. We take to summer activities to help us stay cool. They work great and the grandkids love them. My father in law is always sweating and I bought him one and he loves it!